Altitude renge: 4,100-4,600 meres above sea level. Habitat and Ecology: The species occurs in humid puna grasslands. It is relatively abundant where it occurs. Collection does not occur due to its size. In Imata (Perú), the species has been affected by the construction of Pillones dam related to the mining industry; it was not flooded, but rather destroyed by the vehicular movement related to the construction. The same happened in Melgar (Puno). 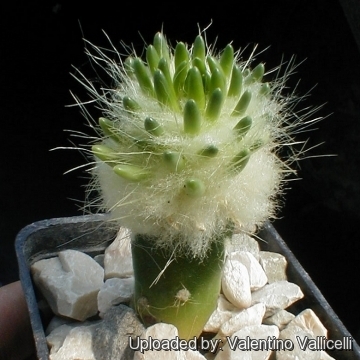 Description: Austrocylindropuntia lagopus, firstly described as Opuntia lagopus by K.Schum. in 1903, is a low growing cactus species forming very dense, large cushions to several meters in diameter and a height of 60 cm. From the areoles arise very fine, up to 2 centimeters long, creamy-yellowish hair. A. lagopus has been frequently confused with some forms of the similar Austrocylindropuntia floccosa which inhabits the same area, but now it is definitively identified with the Austrocylindropuntia malyana of our collections (Described later as Tephrocactus malyanus by Rausch in 1971) and considered a synonym of A. lagopus. Derivation of specific name: The epithet “lagopus” comes from the Greek “lagôs”: hare and “pous”: foot in reference to the narrow stems covered with a thick white wool, evoking the leg of a snowshoe hare (Lepus americanus) . Stem: Segmented, articles short cylindrical, to 15-25(-45) cm long, sometimes shorter and globose, tuberculate. The stems are so densely hairy and conceiled that probably do not have any photosynthesis role, which is indeed supported by the leaves. Leaves: Up to 7 mm long, persistent, fusiform to club-shaped. In habitat the leaves are almost entirely hidden in the hair, but usually noticeably exerted above the hairs in cultivation,. Areoles: Filled with fibrous, uniseriate (formed by a single row of cells, so very thin and Silky) creamy-yellowish hairs to 2 cm long; glochids sparse, hidden, white or glassy, remaining hidden, easily detached and blown away by wind, 1-1.5 cm long. Spine: One, yellow, 2-2.5 cm long. Flowers:** Diurnal, golden yellow, barely emerging from bristles at anthesis, 1,5-3(-4.5) cm long; pericarpels hairy towards the tip. Fruits: Egg-shaped, thin-walled, at first bright green and then yellow to light pink at maturity containing 5-10. Seeds: Spherical or near so, about 5 mm in diameter. Taxonomy:*** Genetic analysis revealed that Austrocylindropuntia lagopus was located at the junction of two genera, Austrocylindropuntia and Cumulopuntia. For this reason D.R. 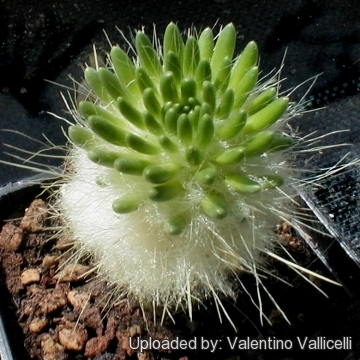 Hunt create a the new monospecific genus Punotia for the sole Austrocylindropuntia lagopus. Austrocylindropuntia malyana (Rausch) F.Ritter: The plant commonly found in cultivation as A. malyana, is now considered a synonym of Austrocylindropuntia lagopus, and not distinguishable from the latter. 4) Friedrich Ritter “Kakteen in Südamerika: Ergebnisse meiner 20jährigen Feldforschung” Band 4, 1981, S. 1244. 7) Friedrich Ritter “Kakteen in Südamerika – Ergebnisse meiner 20jährigen Feldforschung” Volume 4 Peru, Friedrich-Ritter-Selbstverlag, Spangenberg 1981. 8) Cactology. Volume 2, Supplement, 2011. 9) Britton, N. L. & J. N. Rose. “Cactaceae” The Carnegie Institution of Washington, Washington, D.C. 1919. 10) Foster, R. C. “A catalogue of the ferns and flowering plants of Bolivia.” Contr. Gray Herb. 184: 1–223.1958. 11) “Punotia lagopus (K. Schumann) D.R. Hunt 2011” in: Cactaceae Systematics Initiatives 25: 26 (octobre 2011). 12) Ritz C.M. et al., “Molecular phylogeny and character evolution in terete-stemmed Andean opuntias (Cactaceae−Opuntioideae)”, Molecular phylogenetics and evolution 65(2): 668-681 (2012). 13) Eggli U. & Leuenberger B.E., “Type specimens of Cactaceae names in the Berlin Herbarium (B) [De herbario berolinensis notulae 48]”, Willdenowia 38: 213-280 (2008). 14) Urs Eggli, Leonard E. Newton “Etymological Dictionary of Succulent Plant Names.” Springer, Berlin/Heidelberg 2010. 15) Crook I., Arnold J. & Lowry M., “Austrocylindropuntia lagopus clarification of nomenclature and observations in habitat”, Bradleya: Yearbook of the British Cactus and Succulent Society, 21: 87-92 (2003). 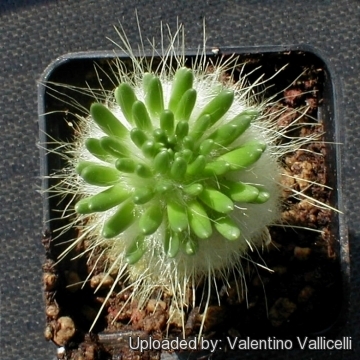 16) Gilmer K. & Thomas H.P., “Beobachtungen an Austrocylindropuntia malyana”, Kakteen und andere Sukkulenten 50(6): 129-135 (1999). 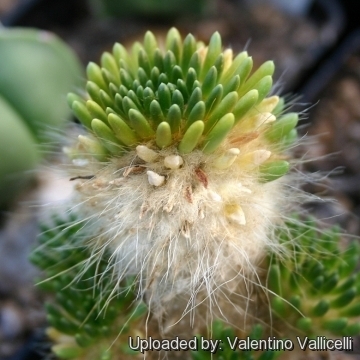 17) Lau A., “South American Cactus Log Part XIII”, Cactus and Succulent Journal (US) 52: 289-292 (1980). 18) Goodspeed T H. “Plant Hunters in the Andes” 81 (1941). 19) Weberbauer A., “Die Pflanzenwelt der peruanischen Anden”, in Engler A. & Drude O., “Die Vegetation der Erde” 12: t. 14 (1911). 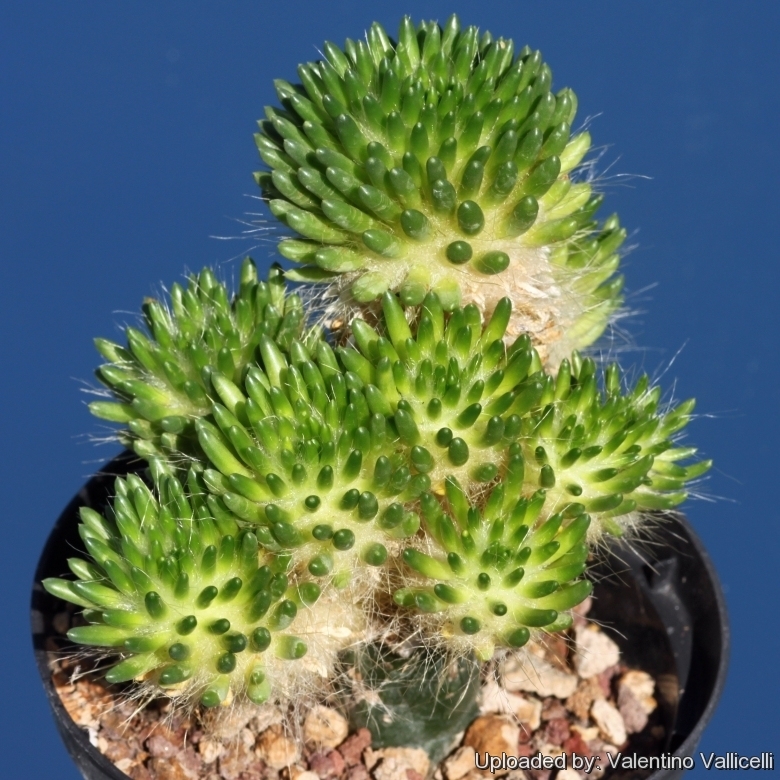 Cultivation and Propagation: Not easy, because of the mountain environment in which the plants live, they need as much direct sun light as possible to encourage the heaviest spines an wool formation, plants in shaded positions grows etiolated and fail to produce the typical hairy covering. They need to be kept in a cool place during the winter rest (at 0 to -10°C) this is important for the flowers as well as for their health. They are quite winter hardy and can be cultivated outdoor, if adequately protected from the rain and kept perfectly dry. Needs good drainage, water sparingly (rot prone). Propagation: Seeds are seldom available and extremely difficult to germinate, best reproduced by cutting that frequently doesn't succeed to produce roots or roots very slowly and unpredictably. For this reason this plant is often grafted. 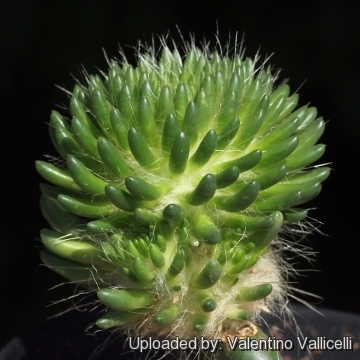 For a very long time, Austrocylindropuntia lagopus (= Austrocylindropuntia malyana) was regarded as incapable to cultivate without grafting, but even this fallacy appeared to concern particular clone.